Learning Outside ! OH YEAH! What a beautiful wonderful fantastic ( any more great adjectives I can throw in there ) day it has been today. Days like this renew my spirit and make my heart smile. When the weather is warmer many days we meet the kids outside in the fence to get a little play time outside before we head in for breakfast. Today, when it was time all I heard we GROANS….. So, I smiled and said ” Ok, lets go in to eat breakfast and then we will decide where we want to play.” If course, after the kids wolfed down their english muffins , green apples and milk they were ready to head back to the play yard. I grabbed our theme box and out we went ! My day did start with this HUGE bow made from newspaper that Mary ( Williams mom ) made for me. 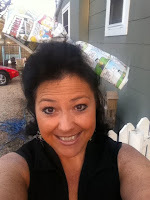 Everyone else got paper hats yesterday and she knows how I am about hats so she made me this bow ! CUTE! The kids LOVE this little toy that Kayla is playing with . 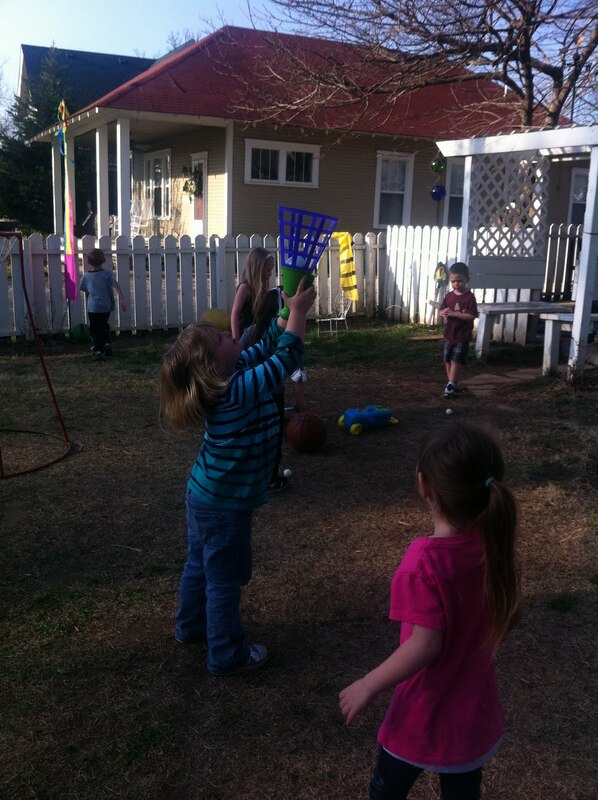 I think it is called a ” Pop-up.” You pop the ball up and try to catch it in the basket part as it comes down. Randy also took out the parachute. I found my parachute book . 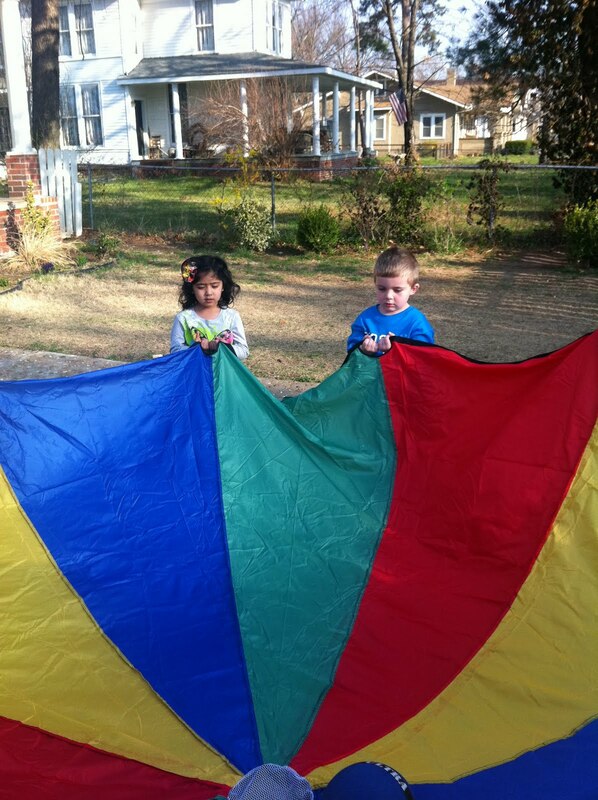 Did you know that just like any other teaching aid there is a METHOD for using a parachute. There are 8 sessions. The first one we did today . ( Up until this point I guess Randy just let them bounce balls in it.) The lesson today was teaching the ” thumbs up” grip. Some of the games in the book call for thumbs up others for thumbs down. So, we practiced thumbs up and sang ” Where is Thumbkin” while we did it. Then we practiced ” the wave.” The wave is created simply by going up and down with our arms in the thumbs up position. We tried it fast and slow and listening when the teacher calls freeze. The kids loved it. Periodically I would ring the bell two short times. That was a call for the children to come to the porch and talk or read or sing. Randy was getting lunch on the table during this time so Geneviette took a picture of me reading . I think she may grow up to be a photographer. She handed me the camera and said ” I took two. I took one of Nolan and Dillion.” When I looked at the pictures I smile. What a sweet picture to take of the boys. We can see rainbows on demand ! Kimber is going to be so excited come May. We will be doing a huge Farm unit. Today he was playing with the tractor on the porch . I loved the way he had his food in the trailer pulling it. And last but not least… You do know that leprechauns will run away if you blink. So, we practiced staring. Here is your Friday Flick. I love St. Patricks Day!! It looks like you guys do too.